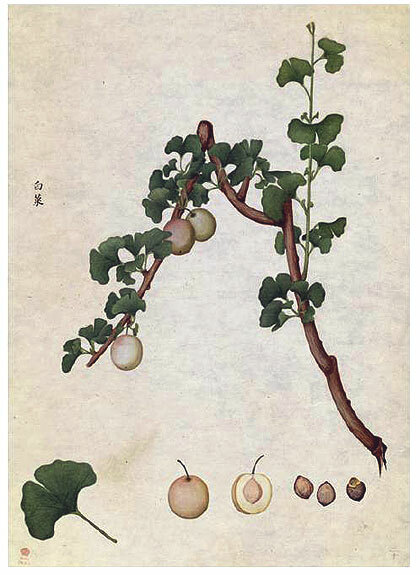 Ginkgo branch wearing seeds (1767): a watercolour of Ginkgo by a Chinese artist working for John Bradby Blake in Canton, China. Blake was in service of the British East India Trading Company. He sent home detailed botanical illustrations of Chinese plants. This is probably the first Western documentation of Ginkgo from its native China. Picture from "773. Ginkgo biloba - Connections with people and art across a thousand years", Peter R. Crane et al., 2013 Curtis's Botanical Magazine. * Added on Nancy-page: photos of Ginkgo leaves on door to The Ecole de Nancy Museum, Nancy Art Nouveau by Jacques Gruber. * New topic: The Ginkgo Tweets: 2500+ followers on Twitter! Video of the Big Ginkgo in Koyodo, Miyoshi-shi, Hiroshima, Japan. This tree has unique trumpet-like leaves, so-called "rappa ichou" (tubifolia). Height c. 32 m, girth 7.28 m.
Video by nimo5 on YouTube.